Hummingbirds might be known for their furious wing-flapping, but that avian family also lays claim to the smallest bird in the world. 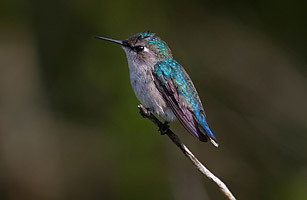 The bee hummingbird, found in Cuba, measures a little more than 2 in. (5 cm), counting the bill and the tail, and weighs about 2 grams  roughly the equivalent of two dimes. The largest of all hummingbirds (the aptly named giant hummingbird) weighs about 10 times as much. Still, the wee bee variety can fly with the best of them, clocking in at about 50 to 80 flaps per second.